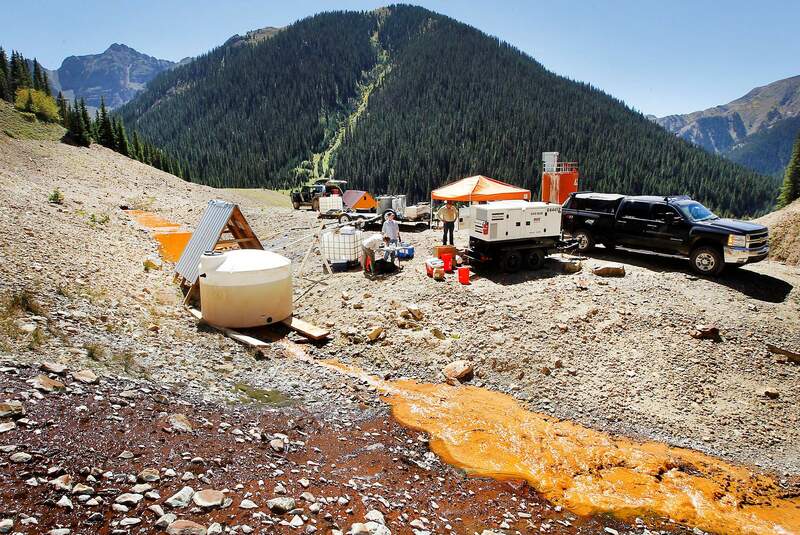 Water flows out of the American Tunnel in the Gladstone area north of Silverton where the Animas River Stakeholders Group wants to eliminate toxic waste from four closed mines. Nick Josties, director of Waste Water Management, takes a sample of treated water from the American Tunnel. Lucy Hunter with Odisea LLC holds the sample bottle. 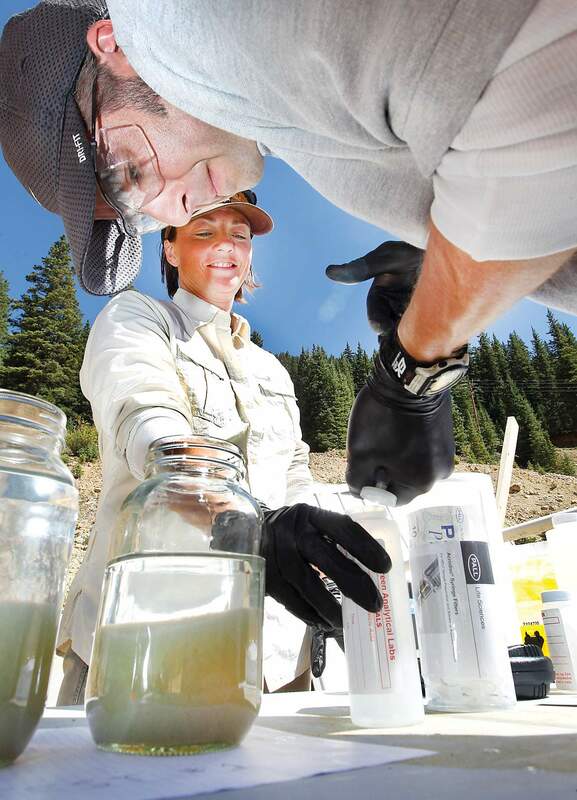 They are testing toxic water from the long-closed Sunnyside Mine which, with three other abandoned mines in the area, is polluting Cement Creek with heavy metals. 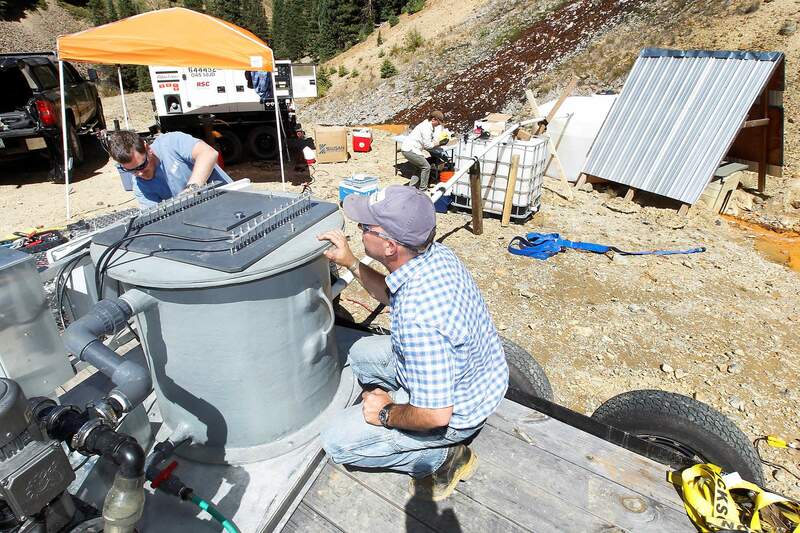 Consultants set up a water-treatment experiment near the opening of the American Tunnel in the Gladstone ghost town north of Silverton. 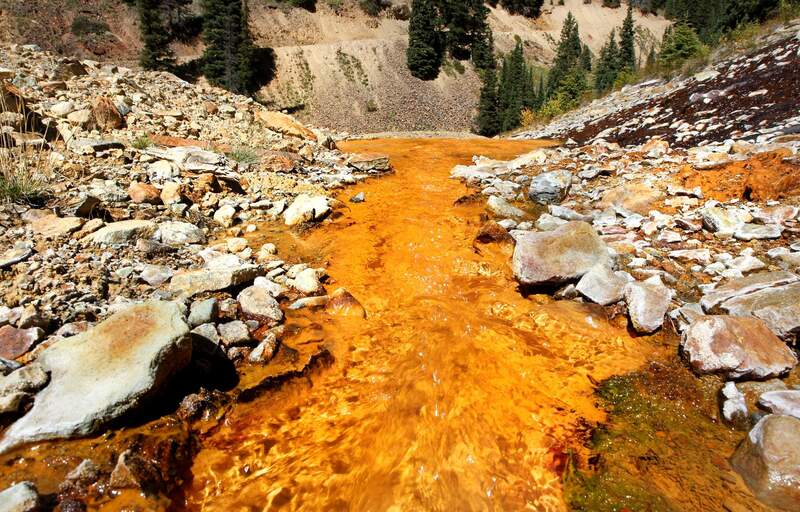 Zinc, iron, copper, lead, cadmium, manganese and mercury are all being released from old mines into Cement Creek, and the heavy metals eventually reach the Animas River. Mike Rigby, left, with Electro-Chemistry LLC, and Jeff Ruppert, with Odisea LLC, work on the flow-though reactor that treats water from the American Tunnel at the Sunnyside Mine north of Silverton. The reactor applies electricity to water and then the dissolved metals settle out to form sediment. Nick Josties, director of Waste Water Management, lifts up a reactor after treating water from the American Tunnel in the Gladstone ghost town north of Silverton. The batch reactor applies electricity to water and then the dissolved metals precipitate out as sediment. GLADSTONE – This ghost town north of Silverton is again the focus of an effort to eliminate the toxic brew draining from abandoned mines that once produced millions of dollars in gold, silver and other metals but left corrosive residue. Scant yards from where waste from the Sunnyside Mine used to be treated with lime and drained into settling ponds, a pilot project is testing whether an electrochemical process can neutralize heavy metals to an environmentally acceptable and economically feasible level. A favorable answer would delight members of the Animas River Stakeholders Group, a broad band of public and private interests that has been looking since 1994 for a way to clean the toxic metals. 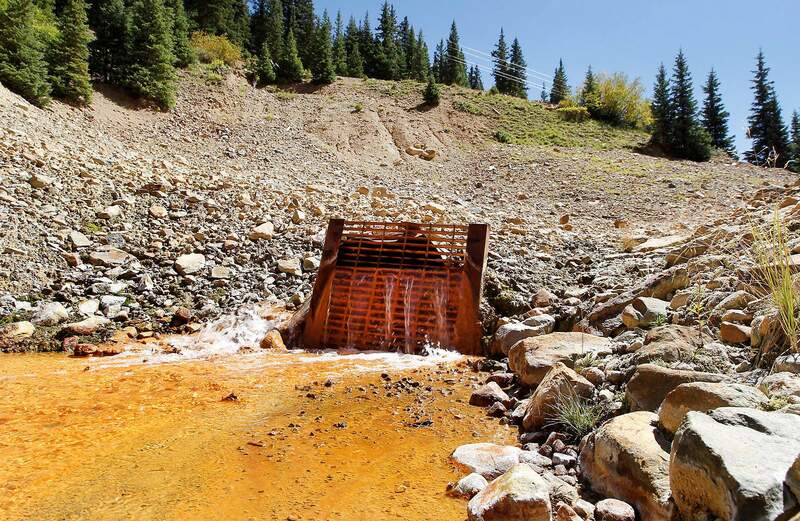 An estimated 800 gallons a minute of water containing zinc, iron, copper, lead, cadmium, manganese and mercury empty into Cement Creek, which joins the Animas River at Silverton. Cement Creek is so toxic that biologists doubt that it ever sustained aquatic life. Waste Water Management Inc., and its subsidiary Electro-Chemistry LLC, applied their technology to drainage from the American Tunnel earlier this month. Tests were conducted in two reactors at varying levels of electrical intensity and duration. In one reactor, treated mine effluent was pumped into a clarifier tank and allowed to settle before being sent away for analysis; in the other, the treated effluent was sent for analysis immediately. Initial results indicate it’s not going to be an easy victory, said Kay Zillich, the Bureau of Land Management liaison to the stakeholders group. What stakeholders need to know is optimum power requirements, the levels of dissolved metals and particulate that will fall out, pH levels and the characteristics and total amount of suspended solids that will result. 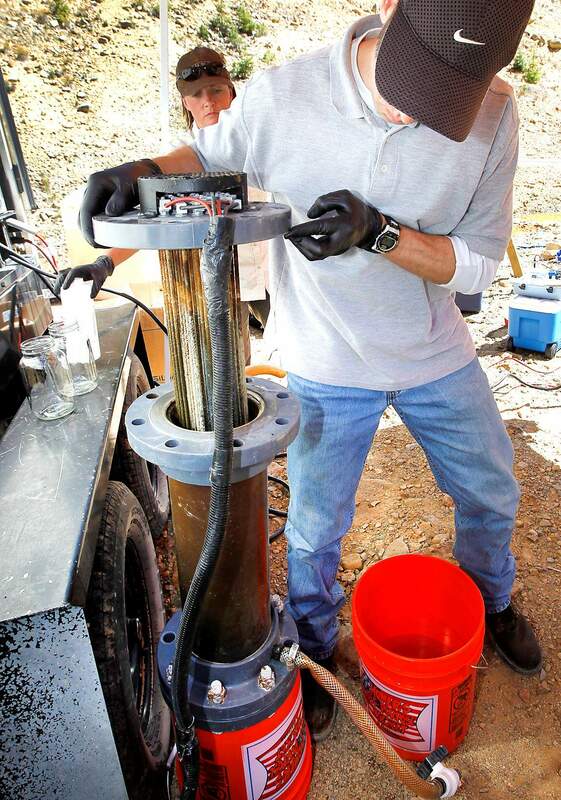 The findings could indicate whether recovery of metals from the resulting sludge is feasible. Mike Rigby of Electro-Chemistry said the technology is being applied in the natural gas, oil and maritime industries and in wastewater treatment. The firm’s electrochemical technology has been at work for a year at a commercial laundry in Dubai where the desalinization of water is extremely expensive, he said. The BLM is coordinating the testing for a couple of reasons. The outlet of the American Tunnel, which drains Sunnyside Mine (closed since 1991), is on BLM property, and the federal agency can tackle water-quality remediation without worry about repercussions. Not so for individuals or private groups. Under the Clean Water Act, they can be held liable in perpetuity for full cleanup costs. Animas River stakeholders hope the process being tested at the American Tunnel can be applied to drainage from three other mines – the Mogul, Gold King No. 7 and the Red & Bonita that are contributing to the 800 gallons a minute of toxic waste. Steve Fearn, a mining engineer who lives in Silverton and a stakeholders group coordinator, has been visiting the test site here. The amount of water in sludge is critical to the cost of disposal, Fearn said. In conventional sludge disposal, solids constitute 15 to 40 percent of the bulk of the sludge. Rigby said the electro-chemical process can produce sludge that is 30 to 70 percent solids.